To know Arthur Russell is to love Arthur Russell. His music, ranging from classical to disco to ambient the most beautiful, heartbreaking pop music, is a treasure that never seems to fade. Russell passed away in 1992 from complications from AIDS, but his music is as invigorating and wonderful today as it was 30+ years ago when it was created. 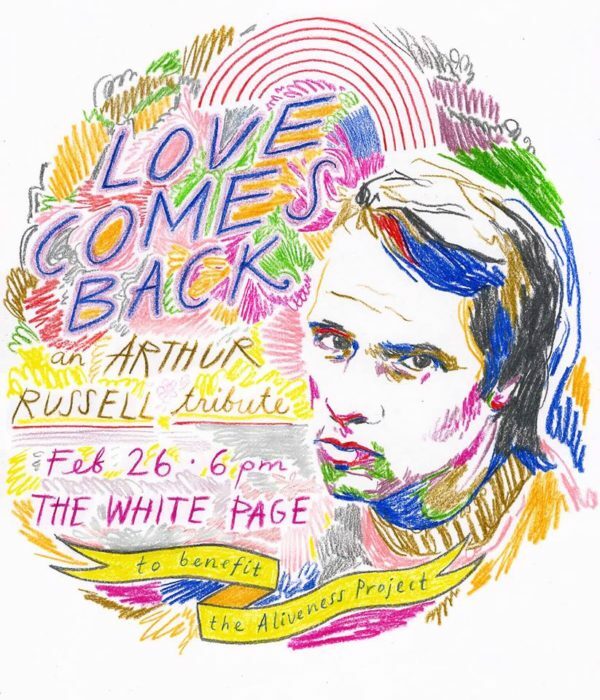 Tonight a group of local artists are hosting “Love Comes Back: A Tribute To Arthur Russell” at the White Page Gallery in South Minneapolis, with proceeds going to the Aliveness Project, a great organization that supports people with HIV/AIDS in Minneapolis. The suggested donation is $5, and with that you’ll get a compilation of local artists covering Russell. You can sample one of the artists (Dan English) covering Russell’s “Close My Eyes” below. More details/RSVP for the event, which runs from 6-9 pm at the White Page, can be found HERE.